In the world of office furniture, shelving is hardly exciting. Something eye-catching that takes centre stage such as a boardroom table or glass desk seems more interesting. However, that doesn’t mean glass shelving shouldn’t look good. At Glasslab, we have a range of shelves, that act as display units and sideboards. Glasslab offer a simple service when it comes to your furniture. You don’t want to waste hours putting together a flat pack piece, desperately trying to find the missing screw and wondering why you have a spare bolt. Every Glasslab piece comes as one – already created and ready to use. But which Glasslab shelving design should you choose? The Ossa design is the simpler of our two ranges. An easy cubic look allows you to display your items symmetrically, in between panes of 10mm clear toughened glass. The Ossa sideboard features eight display squares over the 1590mm wide and 440mm deep piece. 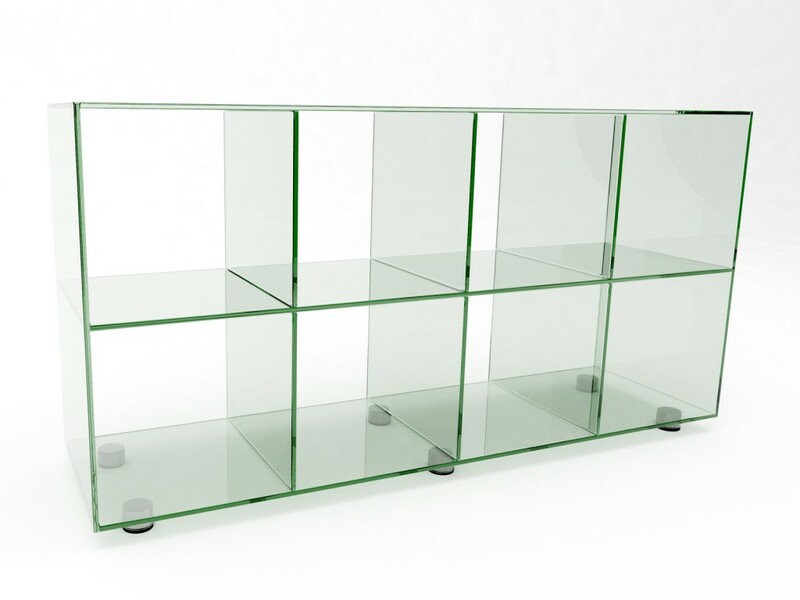 A similar piece is the Ossa double glass display shelving unit. It’s made to the same measurements as the sideboard, but is designed to stand lengthways, rather than horizontally. Once again, it features eight places for your items to be displayed, but this time stands tall, with a width of 800mm. It’s a little taller, at 1730mm, but now features four, rather than eight, compartments. The different sizes suit different individual needs, while continuing to be manufactured at the same high quality standard. 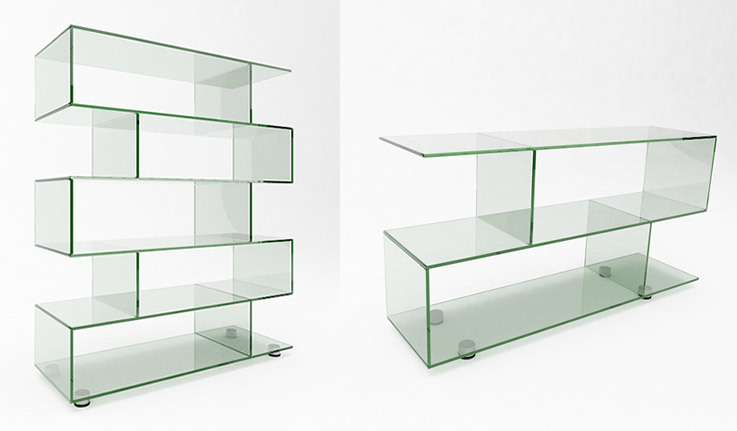 As mentioned earlier, Glasslab’s shelving units fall into two design ranges. The simplistic, cubic ‘Ossa’ line, and the more unique looking ‘Lissi’ design. Lissi comes in two forms – the sideboard and the display unit. Both of them show an almost uneven, ‘zig zag’ style and are created out of 12mm toughened glass. The Lissi display shelving unit stands at 1525mm high, with a width of 1192mm. It has five levels to it, each with a large space to place items. Meanwhile, the Lissi sideboard keeps the same design but on a smaller scale. With only two levels, it stands at 740mm, but is a little wider at 1400mm. Although each Glasslab shelving unit comes with a set size, a bespoke design service is offered, ensuring your choice of product is created to suit your individual requirements. As well as resizing products to fit your space, you can also come up with your own design. If you have a certain creative idea in mind for your shelving unit, Glasslab will be happy to put it into action and create your perfect piece of furniture. Full details on our bespoke furniture service can be found here.